The Clean Air and Action Plan for the City of Stuttgart is valid since 01/01/2006 and is listed on the website of the Stuttgart's regional council (Download ) for inspection. The EC framework directive on air quality (1996/62/EC) as well as its underlying directives (1999/30/EC, 2000/69/EC and 2002/3/EC) determine ambitious and binding limit values as well as guide values and target values for various air pollutants in order to guarantee a condition of the air with no harmful consequences for people's health or the environment. These guidelines have been translated into German law by the 7th Amendment to the Federal Immission Control Act and by an amendment to the 22th Ordinance to the Federal Immission Control Act in September 2002 as well as by the 33rd Ordinance to the Federal Immission Control Act in 2004. 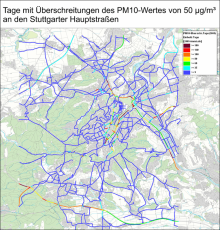 If the sum of limit value and margin of tolerance is exceeded for one or more pollutants in a particular area, the responsible public facilities (Stuttgart's regional council , webpage available in German) have to establish a clean air plan including all necessary measures to make sure that the limit values are adhered to permanently from the particular appointed date on. If the particular limit values are not adhered to after the appointed date, an action plan will be necessary ensuring the adherence to the limit values by short-term measures. The limit values for sulphur dioxide, carbon monoxide, benzene and lead are adhered to in Stuttgart. 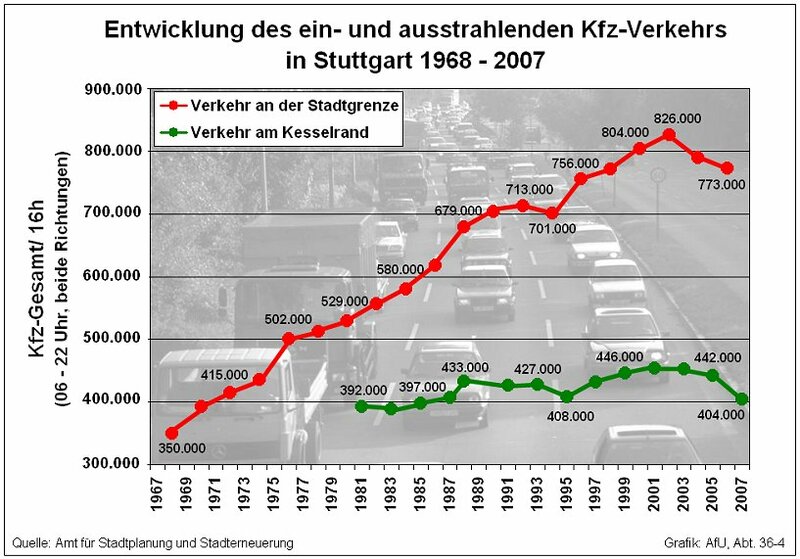 The daily value of 50 µg/m³ for particulate matter (PM10), however, is exceeded on more than the maximum 35 days in Stuttgart. This is proved by measurements from the years 2004 and 2005, in which very high concentrations of particulate matter (at the measuring station Am Neckartor) were made out on a number of days with inversion weather conditions (slide show). This means that the daily value for 2007 was exceeded on 110 days at this station, the daily value for 2008 also on 89 days. As for nitrogen dioxide (NO2), the relevant short-term limit value (98 percentile) is partly exceeded. This is the case for places with heavy traffic. Instead of the maximum amount of 175 hours above 200 µg/m³, 377 hours were counted in 2008. As for NO2, the limit value of 40 µg/m³ valid as from 2010 plus the defined margin of tolerance is also partly exceeded. The figure shows the position of the three road measuring point (spot measurements 2009) run by the LUBW. Traffic is the main source for both particulate matter and NO2. Although the EU exhaust emission standards (see figures on petrol-driven cars, diesel cars, trucks, trucks (particles)) have continually been tightened during the last years, the traffic growth (see figure on traffic development) has partly compensated for this. The clean air and action plan established by the regional council was published on 16 December 2005. It came into force on 1 January 2006. The city of Stuttgart has helped the regional council to establish the plan, for example by deciding on the formation of a subcommittee on air pollution control of the city council in November 2004. Please click here for current data (in German) on the measurements at the spot measurement stations run by the LUBW. Please click here for a pollutant forecast (PM10) for Germany (in English and in German) established by EURAD (University of Cologne). 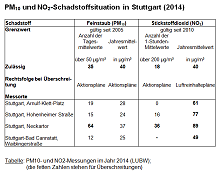 The following table summarises the current pollutant situation in Stuttgart for 2008 as for PM10 and NO2.